The Cunning Linguist, by Dr. Lederer. We could talk about the economy or the budget, or even the Middle East and it would all safely fall under "Tense Times". However, none of those things is the subject of this post. I was reading through a Steven Pinker book entitled Words and Rules: The Ingredients of Language, and came across a gem of a poem. It talks about some things none of us quite understands, irregular verbs. Richard Lederer, the author of the poem: A Tense Time with Verbs, manages to explain what we cannot grasp and even put it to rhyme. This guy is the master of puns, also, consider the book title to your right and you will see. The verbs in English are a fright. How can we learn to read and write? Some faucets leak, but never loke. We bite our tongues, but never bote. And preachers preach, but never praught. I smell the flowers, but never smold. Then do we play, as once we plew? Then do cows moo, as they once mid? I seldom sin, and never son. I didn't choose, and never chost. I fling a ball, but never flang. This poem I like, but never luck. I bake a cake, but never book. I beat an egg, but never bate. I skim some milk, but never skam. I tie a knot, but never tew. I flee from falsehood, never flaw. I land a fish, but never lood. About these verbs I sit and think. Of verbs that never fat or wrought. This is all fine work by Dr. Lederer and if you own it or if you're Dr. Lederer and don't want it up here I'll gladly take it down, simply send me a message here: Contact Us. Thank you. Amazon.com: Words and Rules (In case you buy things). 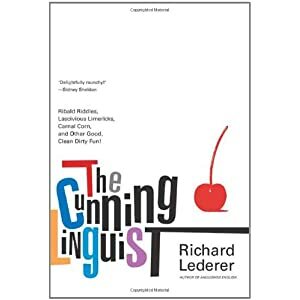 Amazon.com: The Cunning Linguist, by Dr. Lederer (book). Jewish World Review, October 26, 2010: A Tense Time With Verbs. Ha, it's wonderful. It's true! LOL. Love that poem. I've always thought that English is one of the most difficult languages to learn. English is my second language and sometimes, I still have difficulties. hahah! such a lovely poem! but it is true. English is such a weird language with its weird pronunciations and spellings. Shutterbug, first language or no I think it requires a lot to learn all these little details that make us more than the average language user. You'd be surprised sometimes how well people speak their second language. Often if someone speaks it well he/she can reach a higher technical proficiency in the language than a native speaker. Grammar, of course! I don't believe I've ever picked up on the fact that English is not your first language, keep up the good work! It's Just a Comma, Momma!